Your Western Wonder tour will begin at London’s Paddington Station where you’ll board the GWR Night Riviera service to your first destination – Truro! Complete with a cabin on the sleeper train, this overnight ride will become your bedroom on wheels for a comfortable and care-free night’s sleep all the way to Cornwall. Your 2nd day will begin in the picturesque city of Truro in Cornwall. There’s no better way to start your day of exploration than with an unforgettable beach breakfast with the backdrop of the Cornish coast! Why not discover Truro’s rich history with a visit to the famous Royal Cornwall Museum? With permanent exhibitions of Ancient Greek, Roman and Egyptian artefacts, it’s a time-travelling adventure without having to leave the present day! Your Western Wonder Tour includes entry to the historic St Mawes Castle, one of King Henry VIII’s fortresses. Dating back to the 16th century, this elaborate castle was used to prevent the invasions of Spain and France and was able to hold artillery to defend any oncoming attack. Here, you’ll get to explore the grounds, enjoy outdoor theatre and discover its rich history through the centuries. The third day of your Western Wonders Tour begins in the historic City of Bath. 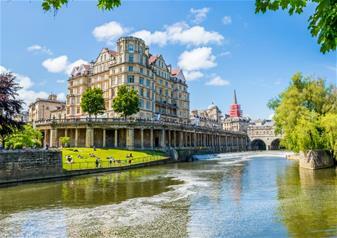 This gorgeous city is home to one of the most-visited attractions in the UK – the Roman Baths, the romantic Pulteney Bridge, the Jane Austen Centre and some of the most exquisite Georgian architecture in the country. You’ll get to enjoy a tour of the world-famous Roman Baths as you follow in the footsteps of the Romans that bathed here more than 2,000 years ago. It’s no guessing why this attraction draws thousands of visitors in every year as the only official hot spring in the country with the extra special opportunity to sip the bath waters in the Pump Room. Get your cameras at the ready as you explore this UNESCO World Heritage Site with your Roman Bath discovery tour. Enjoy leisure time in this exquisite British city by visiting one of the many museums, indulging in a sweet treat from one of the independent bakeries or enjoy the shops that line the cobbled ancient Roman streets. Day 4 of your Western Wonders Tour begins with taking the train to your final destination – Salisbury. Check-in to your idyllic hotel, drop off your luggage and get your adventure shoes on as you head to the famous Salisbury Cathedral! Here, you’ll get the special chance to climb to the top of the Salisbury Cathedral Spire for spectacular views of the city. Work your way up 332 steps and be met with some of the best panoramic views that Salisbury has to offer! If you’d rather not test your nerves on the tower climb, there’s much to explore in the Cathedral itself. Enjoy the oldest mechanical clock in the world hidden in the bell tower, discover monuments and memorials and soak in sensational historic architecture throughout. Your Western Wonders Tour has come to an end and it’s time to take the train back to London. Board any train time at your convenience using your Brit Rail Pass and head back into the capital.